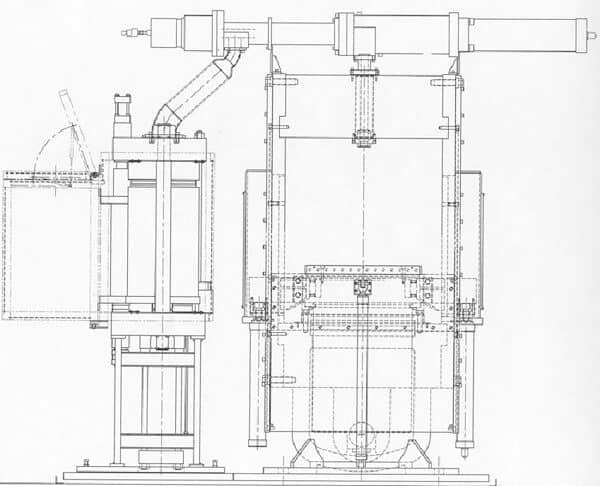 Modern automatic hydraulic presses are frequently equipped with mold or platen shuttling and part removal devices to automate and facilitate the molding process. TMP will custom design these shuttles to handle your particular mold design and material handling requirements. Further automation is also available to improve your process. TMP TECHNI-MOLD automatic hydraulic press designs are innovative, flexible and lower process cost. Contact a TMP representative for more automatic hydraulic presses information. TMP, A Division of French offers a new heavy-duty slab side automatic hydraulic vacuum press for cold pot transfer molding parts for the automotive industry. Read how the custom hydraulic press was designed with low deflection and solid steel platens with heating elements divided into multiple zones for enhanced temperature uniformity. TMP, A Division of French recently developed a multi-purpose, 300-ton vacuum automatic hydraulic lamination system for the printed circuit board industry that allows research development with high-end experimental material, product samples and small run production capabilities. Read more about the automatic hydraulic lamination press features like the integrated closed-loop cooling system that allows rapid and controlled cooling capability.